Improving the Internet is no longer a niche topic. Accenture recently published a new research report called “Securing the Digital Economy – Reinventing the Internet for Trust”. They outlined several problems where current usage of the Internet and its fragile underlying infrastructure puts the digital economy at risk and identified three areas (governance, business architecture, technology), where companies need to promote changes or innovate themselves. While they will certainly spread their findings among their customers, they also sponsored the trending hashtag “InternetofTrust” with the caption “The Internet is broken” on Twitter, to spread awareness about the problems the Internet currently faces. It should be interesting to apply Accenture’s report to Skycoin’s vision of a new Internet, to see in how far Skywire delivers solutions for the identified challenges. As one of the leading global management consulting companies,1 Accenture has an insight on challenges, that corporations are facing all over the world. Accordingly, their research report identified several challenges that are affecting the digital economy. They suggest, that solutions for these challenges can be made “Above Ground” and “Below Ground”. “Above Ground” describes improvements in governance and business infrastructure, that are mainly performed by the corporations themselves. “Below Ground” refers to improvements in the technical infrastructure, that will mostly be developed by third parties,2 such as Skycoin. 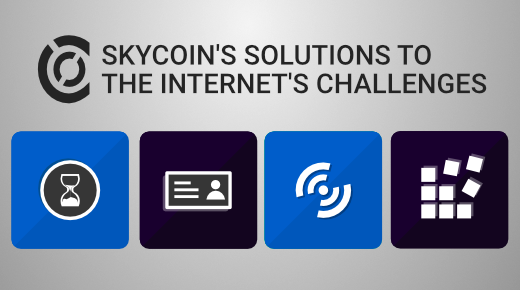 In the following, we will take a look at the challenges Accenture identified and will discuss in how far Skycoin can contribute to solving these challenges. The second challenge identified by Accenture is based on the growing number of devices connected in the Internet of Things (IoT). They state that due to IoT enterprise networks have grown from thousands of end points to several million end points, which puts them at risk because every connected device is a potential vulnerability.10 The report is a bit vague in that regard and doesn’t mention specific security issues, but I would assume they are talking about the difficulty of preventing unauthorized access to IoT devices via potential back doors and the challenge of keeping the software of all IoT devices up to date. These investments show, that companies aim to build upon a more secure infrastructure in the future. However, with gradual improvements to the current infrastructure of the Internet, I see the risk of solving only temporary issues but not fighting their underlying causes. Skycoin’s approach to build a new Internet from the ground up is certainly more complicated in the short-term, but it could succeed at solving some of the Internet’s underlying issues in the long-term. The fulfillment of Skycoin’s visionary mesh net infrastructure should therefore be in the interest of all companies in the digital economy. Given the enormous investments in security startups, some of the large corporations in the digital economy might even be interested to accelerate the implementation of Skywire with a strategic investment. The article showed five challenges identified in Accenture’s recently published research report, that put the digital economy at risk. The report stated, that the rapid growth of the Internet couldn’t keep up with the introduction of necessary improvements at its base level. Its standard protocols are unfit for current demands and will be put to a test, when billions of IoT devices will be connected to the Internet in the next years. But not only machines put the web to a test, managing the identities of individuals is another challenging task for corporations. The report also stated, that the ongoing digital fragmentation of the world wide web will most likely slow global economic growth down. All these challenges will result in higher costs for companies, which have already invested 114 billion USD in 2018 in cybersecurity. Skycoin’s flagship product Skywire – currently in development and not released yet – can be a solution for some of the challenges identified in Accenture’s report. Skywire has generally been perceived as a censorship-resistant platform, that allows individuals to use the web without being surveilled by centralized institutions. But as applying its core design principles like decentralization or end-to-end encryption to the five discussed challenges showed, Skywire should be a very interesting implementation for corporations and could generally help to move the digital economy to new levels of connectivity. The projected growth of IoT devices is displayed in a graphic in the article.